Thought you might enjoy this reblog on a beautiful Sunday morning (blue and sunny in Hawaii)! Our grown children and their families are dog lovers as you can see! 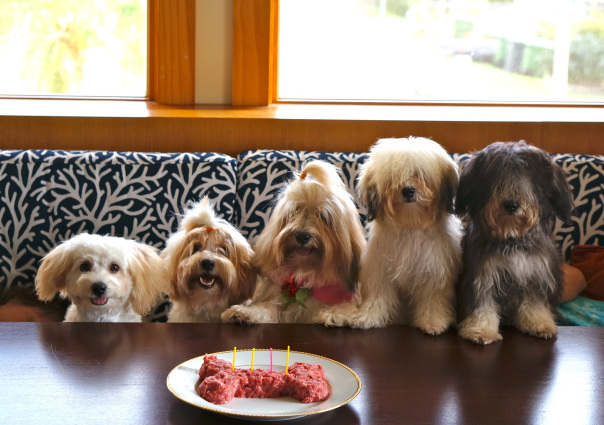 Mommy dog in the middle with red bow celebrates her 4th birthday with her brood. Hoku, on the far left, is our newest ‘granddog’ (we have 4 granddogs total). He was dropped off to visit a few days with his dog family- his mom and 3 of his remaining siblings. His human family, my daughter, husband, their son and daughter went to Anaheim Disneyland to celebrate their Thanksgiving and daughter’s birthday, which fell on Thanksgiving this year.